Spring Is In The Air "Spring Krispies"
Spring is in the air and people are busy transitioning their home decor into bright and energetic colors! You don’t need to stop there. You can dress your desserts up with spring colors too when you make these “Spring Krispies.” These sweets are simple to make and your kids will love them. 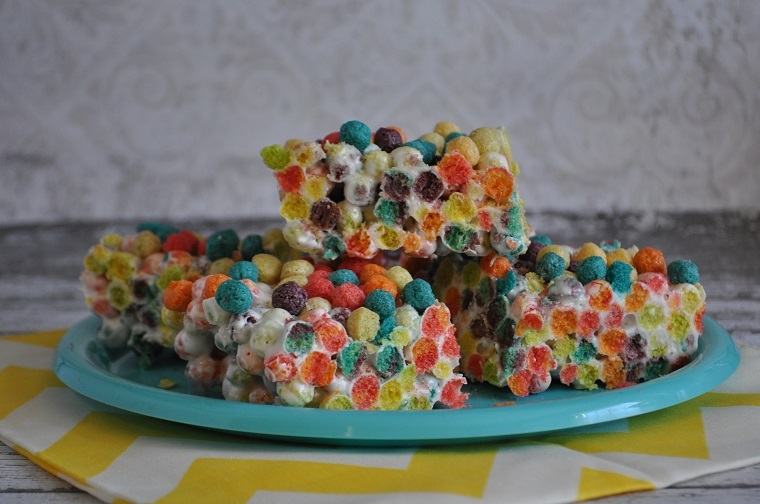 This recipe is basically very similar to making Rice Krispie Treats, but with a fruity spin because you use Trix or a similar generic brand instead of Rice Krispies. We found that Great Value Fruity Puffs (Walmart brand) seems to have brighter colors and therefore makes the dessert even more festive and spring like. There are only three ingredients in this dessert and you just need your microwave to make these colorful and fun treats! Serves: This recipe will yield a pan of 9 x 13 Spring Krispies. 10 cups Great Value Fruity Puffs (you can also use Trix cereal but the Walmart brand seems to have brighter colors). One 14.8 ounce box will be more than enough. Spray Pam (or your favorite vegetable oil spray) to coat a 9 x 13 pan. Set aside. In a fairly large glass bowl, add the butter and marshmallows and microwave for 2-2 ½ minutes or until the marshmallows are melted. Stir halfway through the cooking time with a rubber or silicone spatula. Add the cereal and stir (with your rubber or silicone spatula) to evenly coat with the marshmallow mixture. Pour the coated cereal mixture into your greased pan. Using a spoon or spatula (spray with no stick spray first), press the mixture down into the pan. Allow the treats to cool and set for up to 15 minutes or more. Cut evenly into squares and serve. This recipe will yield a pan of 9 x 13 Spring Krispies. So there you have it! Simple, quick and fabulously tasty and colorful. These would be great treats to decorate your Easter table or to serve at a child’s birthday party. But forget the saying that “Trix are for kids.” Adults love these treats too! That’s a nice twist to rice krispies using the colorful fruity puffs! Wonder how it taste! Wow they are colorful! I’d make them if my son wasn’t gluten-free, he can’t have those. I love how easy marshmallow treats can be! My whole family would love these so much! I do not normally feed my kids things like this (full of sugar and processed foods) but I think I might make these on special occasions cuz they are just so cute! I love the bright colors. My kids all really enjoy marshmallow treats! I didn’t know they even made such a colorful cereal. I guess when the kids grow up, you miss out on so much. I need to make these for the Grandkids. Ahh. They are so cute and colorful. My kids would eat these up. These are so cute! They’re perfect for spring parties. Those look really good!! I’m going to pin them so i can make them later with my girls. Those are awesome and so colorful. My son would devour them for sure. Such a great idea! My kids would totally love these! I love recipes with only a couple of ingredients. My kids would love these! I love how colorful these fun treats are. I may have to make these to take to my parents on Easter. Oh my gosh, gimme! I want some fruit krispies right now, haha! I love how colorful these spring crispies are. They are the perfect treats for a kids’ birthday party. Oh how fun! I love the spring colors too. I bet my boys would love this. I can even make it with my youngest which makes it better. I absolutely love to crunch, and I can see that this would not disappoint me there. It looks yummy! How fun do these look? Pinning for later! Thanks! I love Rice Krispies Treats and this is a great new way to make them. Those are a fun snack. I bet my kids would love them. These look delicious and easy to make (which is perfect for me!). I think we will try these tonight. It will be a fun thing to do while it rains outside. Oh, this is a great idea! I like how colorful they are! What a great idea! This is my favorite treat to make. These look so fun! I love the colors. Forget spring, I would be making this all the time. My girls would love this and I am sure it would be a hit at their parties. what a yum snack to make for the kids. What a great way to change up traditional rice crispier treats. This recipe looks so delicious and fun. love the vibrant colors, the kids will love it. I have made these with fruit loops, love the idea of a smaller cereal, going to try these. My teeth hurt looking at these! Which makes them even more awesome! Way more colorful than using rice krispy. Another easy and delicious idea for a sweet treat. Oh My Gosh! My kids would absolutely love these! And I would too! Great idea for a yummy treat! I am counting down the days until our spring break. I know my girls and I will have a ton of fun welcoming spring and gobbling up these yummy treats. Spring Krispies are the perfect treat to welcome Spring! The whole family can get involved with the prep and the celebration afterwards! So colorful, they look like a flower garden! I love this idea. What a great twist to rice crispy treats. I love all of the colors and I wonder if you could do it with coco puffs to make them chocolate.